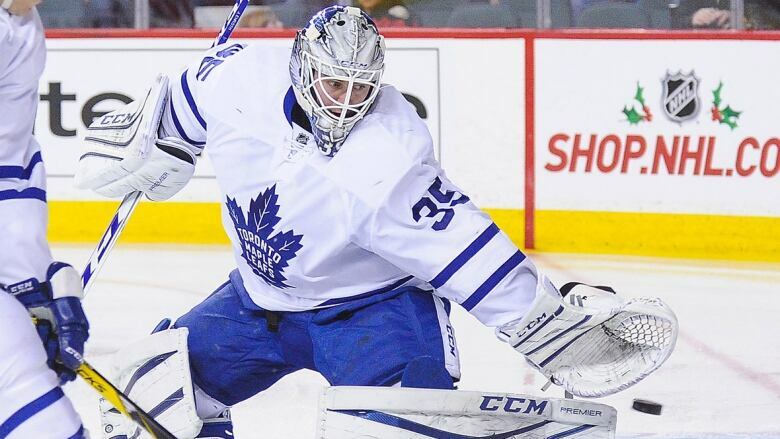 The Toronto Maple Leafs are in the market for a backup goaltender after placing Jhonas Enroth on waivers Monday. The 28-year-old Swede failed to record a win in six games (four starts) this season after signing a one-year, $750,000 US deal in August. The Toronto Maple Leafs are in the market for a backup goaltender after placing Jhonas Enroth on waivers Monday. Enroth, 28, failed to record a win in six games (four starts) with the Maple Leafs after signing a one-year, $750,000 US deal in August. The Swede last played Wednesday in Calgary, where he allowed two goals in the opening minute of a 3-0 loss. He departs with a 0-3-1 record on the season with a 3.94 goals-against average and .872 save percentage. Enroth is 50-69-16 all-time with a 2.84 GAA and .909 save percentage. Last season, the five-foot-10, 170-pound netminder boasted a 2.17 GAA and .922 save percentage in 16 games (13 starts) last season with the Los Angeles Kings. He broke into the NHL in the 2009-10 campaign and went on to play four-plus seasons with the Buffalo Sabres before a trade to Dallas in the 2014-15 season. Toronto management had hoped the Andersen-Enroth tandem was a step up from the Jonathan Bernier-James Reimer duo. The 27-year-old Andersen, after a slow start to the season coming off an upper-body injury, has done his part, going 10-6-4 with a 2.86 GAA and .913 save percentage. The 10-9-5 Leafs are idle until Wednesday when the Minnesota Wild visit the Air Canada Centre.